Heineken, the world’s No.1 international premium beer announced the launch of the STAR CAN in India, coinciding with the global roll-outof the newmodern and progressive STAR CAN design which conveys sophisticated simplicity. 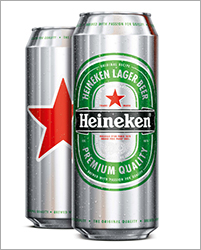 In India, Heineken is currently available in 650ml and 330ml bottlesandthe latest500ml aluminum STAR CAN, which expands the brand offering in India, is expected to attract new consumers and cater to more consumption occasions. The STAR CAN has been designed by the Heineken® Design team in collaboration with Amsterdam-based packaging design agency DBOD over the last two years, exploring multiple routes and iterations, with a focus on details aided by consumer feedback and insights. Heineken has been targeting the globe-trotting, James Bond-inspired demographic through its various initiatives and the new can plays into the image. Packaging is a vital element of the overall brand experience as it is the most tangible point of contact between a brand and consumers. With Heineken®already strengthening its foothold in the super-premium beer market in India, the introduction of the STAR CANto the existing distribution network will also bring in global consistency. The Heineken Star Can will be available in the 500ml size and will be priced at Rs120/-in Maharashtra& Bangalore. The can is priced at Rs 100/- and Rs 70/- in Delhi & Goa respectively.